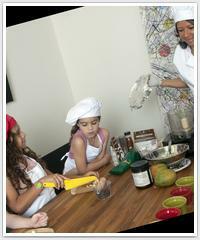 Cooking with Kids Miami is a place where children are chefs and nutrition a way of life. We offer after school cooking classes, host birthday parties, summer and winter cooking camp to children 4 years old and up. Looking for a unique and delicious Indian Cooking experience? Specializing in authentic Indian cooking, Ayesha's Kitchen is the go-to place. Come join Ayesha D'Mello for an exclusive privately held Indian Cooking experience. Ayesha's cooking classes are designed to get you started and beyond (no experience required). Choose from several different menus (vegetarian, veganm non-vegetarian, breads, appetizers/chutneys/desserts, etc.). All classes culminate with a tantalizing sit-down meal. What a great way to travel to India without leaving the kitchen.